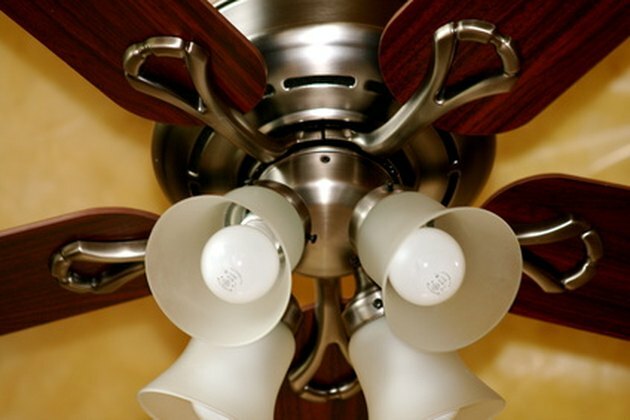 Harbor Breeze is the Lowe's house brand, offering competitive hardware for ceiling fans and lighting. One of the more convenient offerings are the hardwired wall-mounted remote switches, compatible with other well-known brands. One major advantage of these units is that, given the fact they are wired to the electricity, they do not require frequent battery changes. Additionally, quiet operation and reliability make these switches a viable option for those wanting to all but omit pull-chain operation. Wiring a Harbor Breeze wall control is a great idea for those wanting more control over fan speed and appearance. Turn off the breaker at the main electrical panel that feeds the room with the ceiling fan and wall switch. Unscrew the wall plate covering the existing switch. Use a flathead screwdriver to remove the screws, and set aside. Remove the small flathead screws in the mounting tabs, holding the existing switch in place. Pull the switch out of the wall. Loosen the flathead screws on the switch that hold the 110v wires captive. Pull off the wires, and lay the old switch aside. Attach the white and black wires as indicated on the rear of the control. Screw them in place using the flathead screwdriver. On the rear of the wall control and the back of the fan receiver, set the dip switches to the same settings. Make sure these differ from any other Harbor Breeze wall controls that might be installed already. Insert the controller back into the wall. Screw on the supplied cover plate using the captive flathead screws and screwdriver. Attach the control receiver to the wires leading from the ceiling, and heading into the fan. Secure these connections using the supplied wire nuts. Place the corresponding bare wires together (do not twist), and screw on the nut until it cannot turn further. The input and output wires are labeled, color coded, and typically match the existing wiring. Fold excess wiring flat against the receiver, securing with zip ties. Apply power to the room housing the fan from the breaker box. Test all fan speeds and light functionality. Where Is the Transformer on My Air Conditioning Unit?